This is a template that could be used for other major news events. As BBC News online editor Steve Herrmann told Journalism.co.uk earlier this week the election has been a great opportunity for news sites to experiment with coverage and layout, developing features for future use. 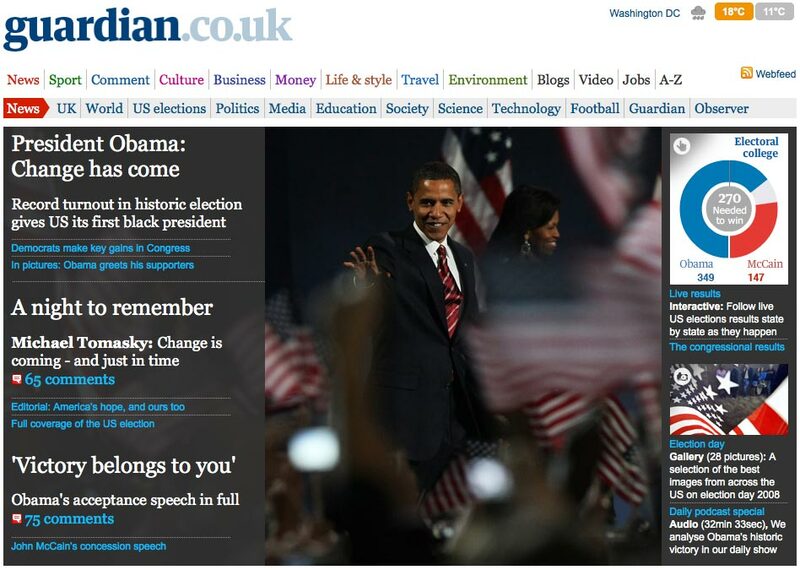 This entry was posted in Online Journalism and tagged Barack Obama, BBC, British Broadcasting Corporation, guardian, Guardian.co.uk, Journalism.co.uk, online editor, Steve Herrmann, US elections, USA on November 5, 2008 by Laura Oliver. While reviewing the best online coverage of election day, CNN’s press office dropped us a line about the ‘magic board’ – a map of the states which will be used by presenter John King to show the results and forecasts as they come in. This entry was posted in Broadcasting and tagged CNN, elections, Funny, John King, magic board, online coverage, Politics, Saturday Night Live, US elections, USA, USA elections on November 4, 2008 by Laura Oliver.